LONDON - Sept. 26, 2017 - PRLog -- Storage Made Easy™ (SME) announced today they have released an updated version of their enterprise File Fabric™ product which unifies all on-premises and on-cloud data into a single workspace for end users. Another security enhancement for this release is integration with the Vault Key Server by HashiCorp which allows keys for data encryption/decryption to be stored in a vault instance and be referenced on demand by the File Fabric as needed. This new integration will be a must for service providers who want to enable their customers to manage their own encryption keys for GDPR and compliance purposes. Collaboration features have also been strengthened by incorporating multi-cloud workflow approvals, allowing companies to stream documents workflows across data silos with feedback and approvals. In addition to this the release now enables real time collaborative editing of documents by multiple users and additionally private 'behind the firewall' document viewers have been implemented as part of the general focus on 'privacy by design' for GDPR. Marco Spoldi, BCLOUD Software Defined Storage Evangelist, said, "Since 2013 SME & BCLOUD have a successful experience together, when we started to integrate SME collaboration feature in our Object Storage portfolio offered to Service Providers in Italy. Our customers and prospects appreciate the whole solution. Service providers and industry customers already know the power of SME. Today, with European compliance, GDPR is mandatory to better control information, and although the existing SME File Fabric already offers us this control, the new File Fabric release strengthens this even further. SME is a real value in our sales proposal." Kamran Yousaf, Storage Made Easy CTO, said, "Companies need to get ready for the upcoming data protection law which will come into force in less than a year from today. This has to be done across the whole of corporate data and not on a siloed piecemeal fashion. The ability for IT to take back control means that they need to be able to control on-premises and on-cloud data if they are to effectively control data compliance issues and challenges presented by GDPR. This new File Fabric release adds important new features that direct corporate customers, service providers, and educational providers will require to meet compliance requirements." The Storage Made Easy™ enterprise File Fabric™ enables IT to regain control of "cloud data sprawl" to unify on-premises and on-cloud files into a single easily managed converged infrastructure with policy-based controls for governance, audit and security. The File Fabric solution provides a "blanket" enterprises wrap around all their data: on premises, within public and private clouds, as well as on third-party software vendor clouds (SharePoint Online and Salesforce for example). 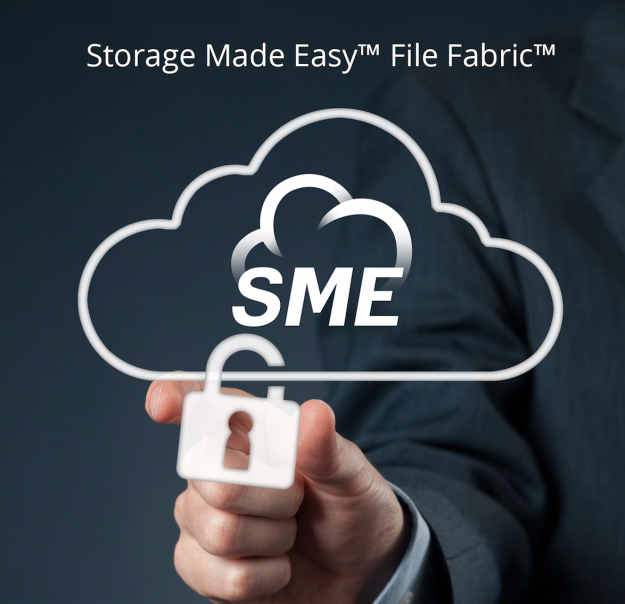 Customers use the SME File Fabric product to unify corporate data to enable workgroup collaboration with universal controls for security, encryption, audit, and data access. Companies will have access to a greater understanding of where and how sensitive data is stored, transferred, and accessible with particular focus on how companies are able to police and audit data to ensure enforcement of the General Data Protection Regulation (GDPR) in addition to other regional data legislation.